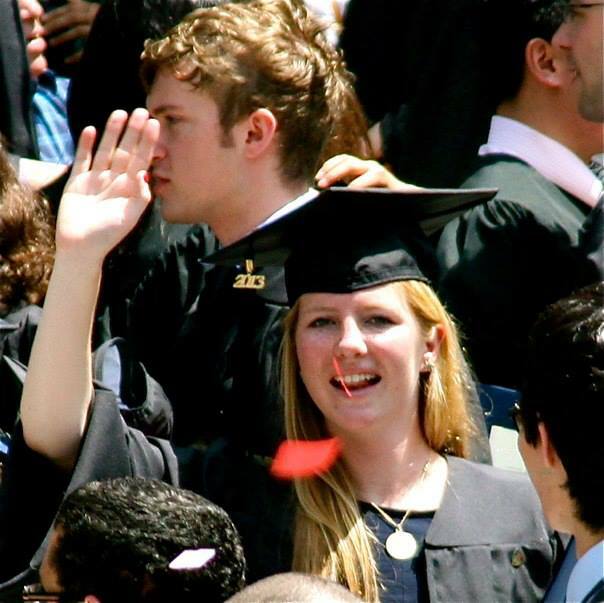 On Monday, my sister Tori graduated from Yale University. 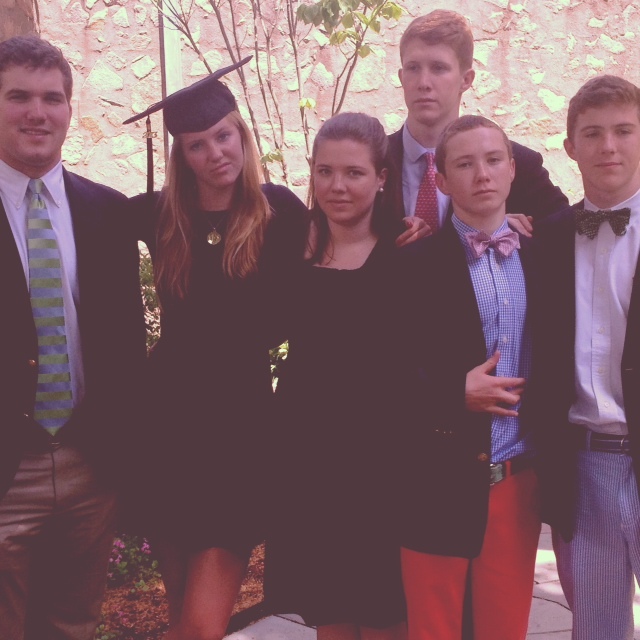 My family celebrated her four years of hard academic work, athletic achievement and partying for three days in New Haven. I joined them one day into the festivities, after having been heartily overserved on Saturday night. I drove to the Yale Class Day ceremony on I-95 in the pouring rain, which is literally my worst nightmare as I’ve become terrified of driving on the highway since I stopped getting behind the wheel regularly. 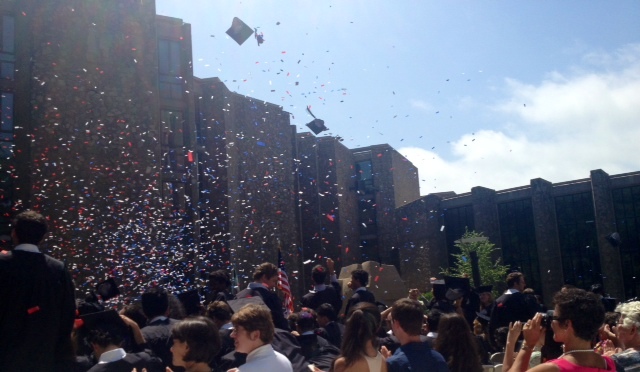 When I finally arrived in New Haven after a three-hour journey – it should have been about ninety minutes – I parked near campus and started on my way to the ceremony, to which I was already late. I asked my brother Aidan where I should meet them. He gave me the wrong location. I ended up walking around a deserted part of the Yale campus in the rain for about 30 minutes – this includes a stop at a cafe to go to the bathroom since I actually was worried that I was going to pee my pants after drinking about a gallon of coffee and a large, blue Gatorade in the car – before my mom called me to tell me where they were. I joined my mom and my grandma to watch a bunch of graduating seniors in crazy headgear – my sister was wearing a white pillbox hat with plastic flowers all over it – give short(ish) speeches to the crowd. I had missed the first half of the ceremony, including Cory Booker’s speech. (My family spent the rest of the weekend talking about it. One of my brothers said he would remember it for the rest of his life. Ugh.) I sat for about an hour in the pouring rain, an umbrella hovering just above my head, occasionally glancing to my grandmother on my left, who was wearing three sweaters and a plastic bag over her hair. Finally, my mom dispatched me to get the car I had driven so that I could drive my grandma back to my sister’s apartment. I met my family there, where everyone gorged themselves on snacks and took naps until it was time to go to my sister’s get-together with her track team at a pizza restaurant called BAR. (I’d been there before and I highly recommend it if you find yourself hanging in New Haven.) Of course, my family was late and we each got like one sliver of pizza. 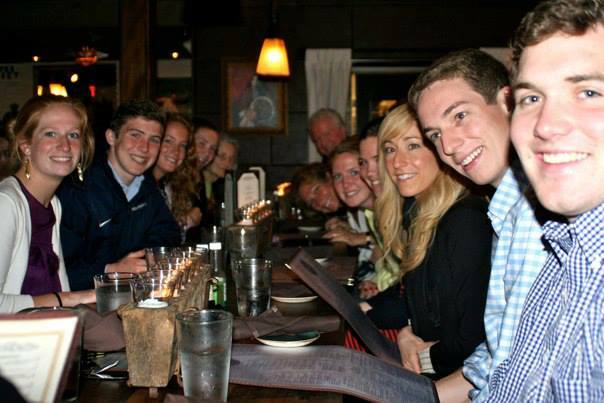 Afterward, we went across the street to Geronimo’s, where we enjoyed some food and drink and so many laughs that I was crying at times with our great family friends, the Hudsons, whose daughter Caitlin was graduating along with Tori. The re-telling of the story of how several of our (collective) brothers were swarmed by a hive of bees when we were kids up at our lake house was a highlight, but there were many, many great moments that night. I drove back to our hotel with my mother, who was liking every Instagram photo ever in the passenger seat. Again, I was terrified while driving on the highway, even more so at that time, because it was dark and rainy and I couldn’t see any of the lines on the road. 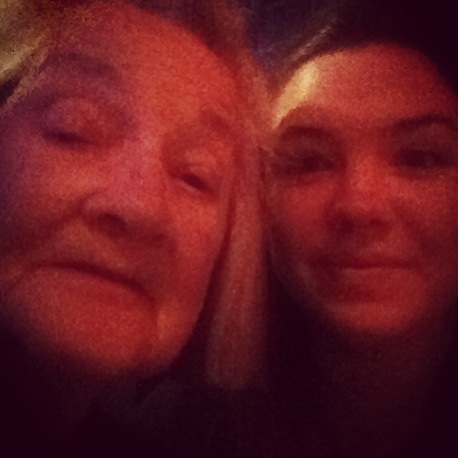 We got back to the hotel safely though and I slept cozily in a bed with my grandma, who kept me awake most of the night with her snoring. My alarm went off at 6:30 but I snoozed until 7, when my mom knocked on our door, already full dressed and ready to head back to campus to save seats for the official commencement ceremony. My brothers, my grandma and I all rushed to get ready. About 30 minutes later, we were all packed up and ready to go. In our seats on Old Campus. 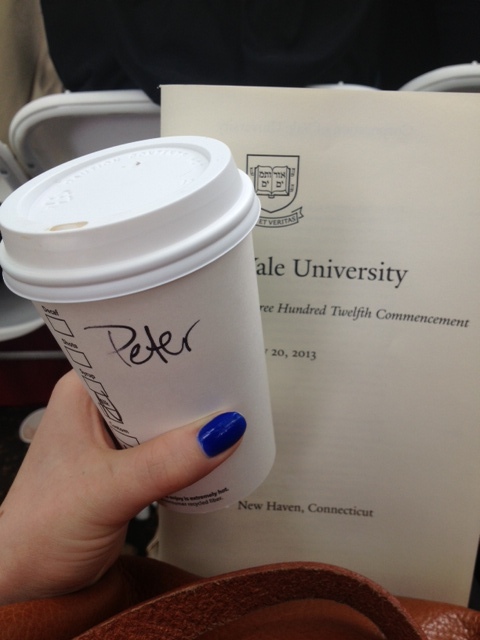 Dayton gives the name “Peter” at Starbucks to avoid confusion. 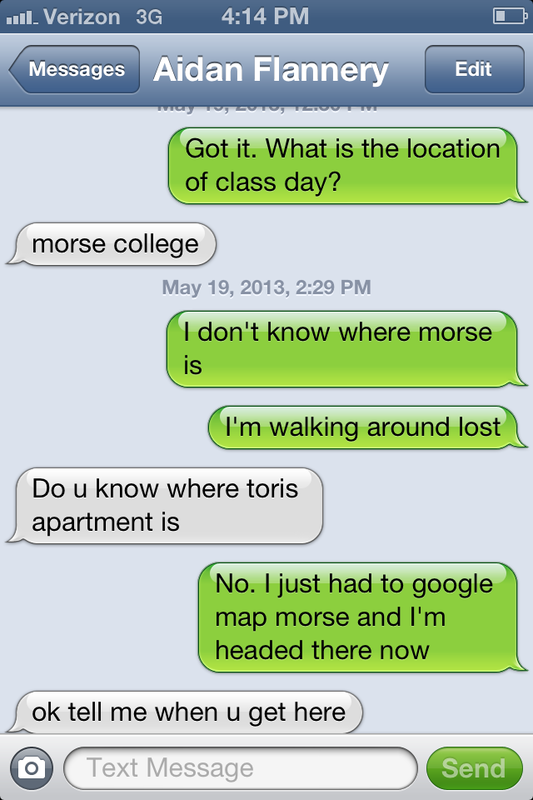 After that, we went to Morse College for Tori’s diploma ceremony. I obviously misread the program and thought the ceremony was at some church and my family listened to me so we ended up really far from where the ceremony actually was and before we realized I had made a mistake. And then on our way there, two of my brothers fell behind us as they were walking with my grandma, so I stood on a corner to wait for them and ended up waiting for ten minutes before realizing they must have gone another way. It turned out some woman had given my grandma a ride in a wheelchair. Anyway, I got to Morse just before the ceremony started and scarfed down a pain au chocolat while standing under a tree. By then, it was hot and sunny so this ceremony was just as uncomfortable as the other were, but for opposite reasons. We heard some speeches from the master and dean of the college before the diplomas got handed out. Finally, Tori got hers and could move her tassel or whatever! Anyway…CONGRATULATIONS, TORI! I couldn’t be prouder of you.